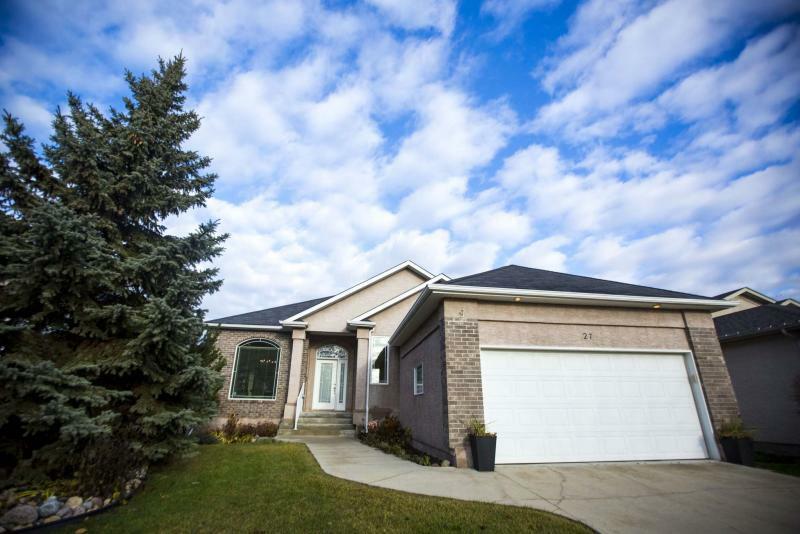 27 Bridgeway Crescent in Royalwood in Winnipeg on Tuesday, Oct. 30, 2018. Winnipeg Free Press 2018. The bathroom at 27 Bridgeway Crescent in Royalwood in Winnipeg on Tuesday, Oct. 30, 2018. The living room at 27 Bridgeway Crescent in Royalwood in Winnipeg on Tuesday, Oct. 30, 2018. The kitchen at 27 Bridgeway Crescent in Royalwood in Winnipeg on Tuesday, Oct. 30, 2018. Even if you’re only 18 years old, you’re bound to show some signs of wear and tear. The same goes for a home of the same vintage, as it seems there are always subtle yet telltale signs of aging. Ryan Davis of Re/Max Performance Realty says although 27 Bridgeway Cres. is going on two decades old, it doesn’t look anywhere near its age inside or out. "This sprawling bungalow was built with quality in mind, on piles and with steel I-beams by Maric Homes back in 2000. It’s been meticulously maintained, so it looks next-to-new everywhere. Its brick exterior is in impeccable condition and its interior looks like it’s hardly been touched." A closer look reveals the 1,814-square-foot home’s layout is as impressive as its overall condition. For starters, a big, bright foyer (the home faces south) branches off in three directions: right into a hallway that houses a den/bedroom, two big secondary bedrooms and a spacious four-piece bath; left into a formal dining room; and straight ahead into a lovely living room. "Even though the home is 18 years old, its floor plan is very contemporary," Davis says. 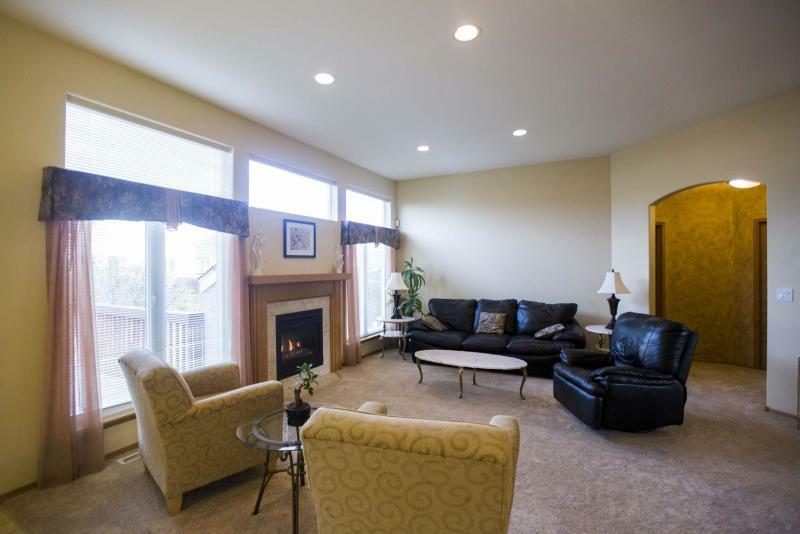 "The living room, which opens beautifully on to a dinette area to its left, is absolutely gorgeous. 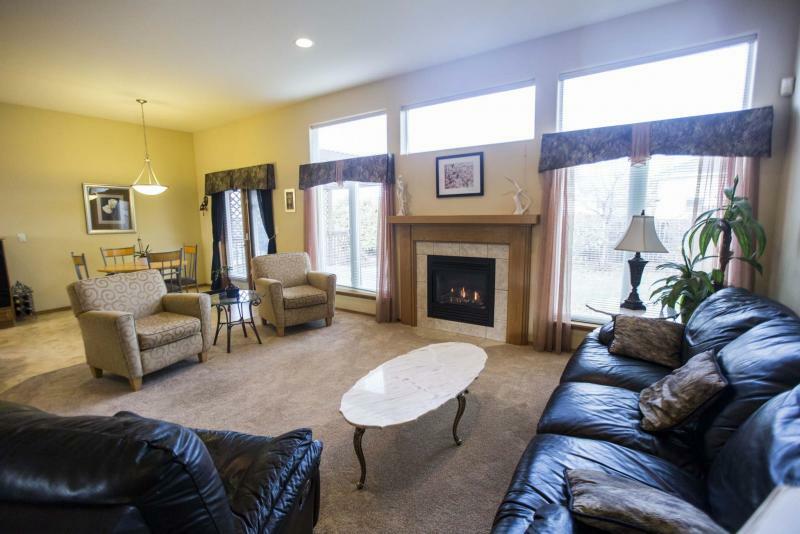 Its gas fireplace is surrounded by huge windows either side and above. The combination not only looks great, but all the windows also let in tons of natural light." Flow from the living room into the dinette area and kitchen, meanwhile, is as good as you’ll find in any newly built home. Patio doors on the wall behind the dinette area (it comfortably holds a table for four) lead to a huge raised backyard deck, while the U-shaped kitchen is positioned perfectly between the dinette area to the right and formal dining room to its left. "There’s all kinds of space to move and create in the kitchen," he says. "It comes with gorgeous maple cabinets, under-cabinet lighting, a big corner pantry and a double sink placed perfectly under a large window. There’s also an abundance of counter space, too." While the great room offers contemporary flow and function, the formal dining room offers a welcome touch of tradition, Davis says. "It’s an elegant, traditional space with its arched doorways, gleaming oak hardwoods and built-in niche for a sideboard, the perfect space for entertaining family and friends. After dinner, you can head out to the deck for coffee, or visit in the spacious yet cosy living room." Because the home was a show home, it’s also filled with some unique design features, including an alcove off the living room that not only holds the master bedroom, but a built-in office area. "It’s a perfect area to put in a computer to make a study area for the kids," he says. "Because it’s tucked off to the side, it doesn’t hamper access to the master suite, yet you can still keep tabs on what the kids are doing while they’re on the computer." Likewise, the master suite is neatly tucked away on the other side of the alcove, making for an ultra-private retreat. "Parents of young kids — this home is perfect for a young family — will love the fact the master suite is well separated from the kids’ bedrooms. It’s a big, bright space with a beautiful tray ceiling that offers a huge walk-in closet and an ensuite with six-foot shower with body sprays and maple vanity." 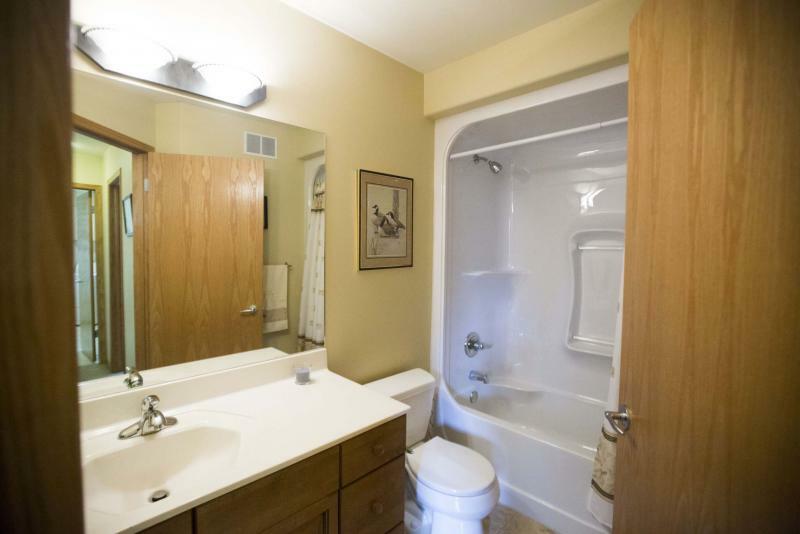 Over on the other side of the home, a wing to the right of the foyer houses four spaces: a den/bedroom with French doors, a second bedroom, four-piece bath with soaker tub/shower combo and a huge laundry/mudroom. "Families will love the laundry/mudroom. It runs directly off an insulated double garage, and offers plenty of space for coats, shoes and sports equipment, along with a sink, washer/dryer nook and window to let in additional light. Both bedrooms are a good size with large windows, big closets, and the entire bedroom wing features newer Berber carpeting." Davis adds that there’s another 1600-plus sq. ft. of livable space available in the unfinished basement. "It’s insulated and ready to go, with plenty of space for a huge rec room, two more bedrooms and a bathroom with lots of storage space left over. It’s a blank slate that a growing family can either develop or use as storage space, depending on their needs." Finally, there’s the home’s ace in the hole — its magnificent location. "It’s situated mid-block across from mature forest and miles of walking trails that wind in and around the Seine River," Davis says. "The forest views are awesome, and when you’re in the forest, you feel like you’re in the country. 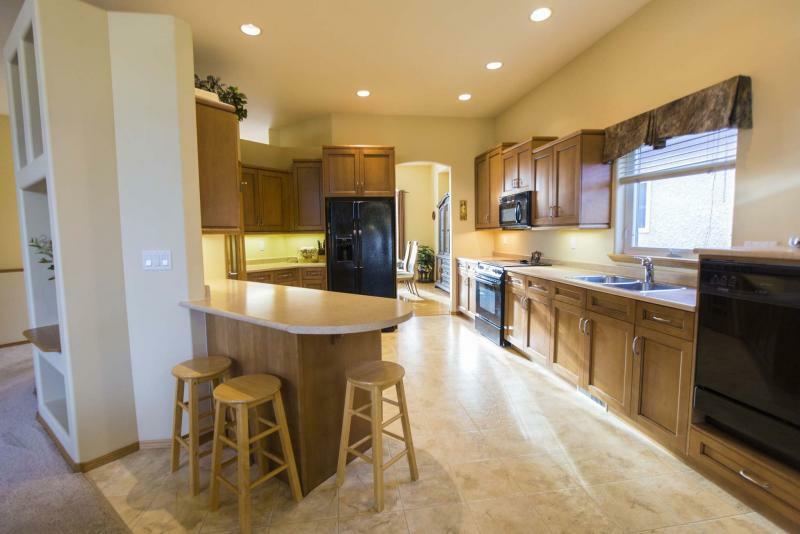 This immaculate home is in move-in-ready condition, and is perfect for a young family."